The California Water Policy Seminar Series, presented by the UC Davis Center for Watershed Sciences and the law school’s California Environmental Law & Policy Center in the spring of 2014, brought together environmental leaders, scientists, agency officials, and others to discuss how water systems can be reconciled to achieve both ecosystem and economic objectives. The series of talks focused on reconciliation ecology, an emerging discipline that is based on the premise that traditional conservation strategies of designating nature reserves and restoration projects will not afford enough protection to present large-scale extinction, and so proposes that human landscapes and ecosystems be reengineered to accommodate both people and wildlife. In this presentation, Robin Kulakow, executive director of the Yolo Basin Foundation, and Petrea Marchand, a local public policy consultant, join Robyn Suddeth, PhD candidate in hydrologic sciences; William Fleenor, senior researcher; Carson Jeffres, field and lab director; and Richard Howitt, professor emeritus in agricultural and resource economics to discuss the ways to optimize multiple economic and environmental uses of the Yolo Bypass floodway near Sacramento. The panel was moderated by Peter Moyle, a professor of fish biology at UC Davis. 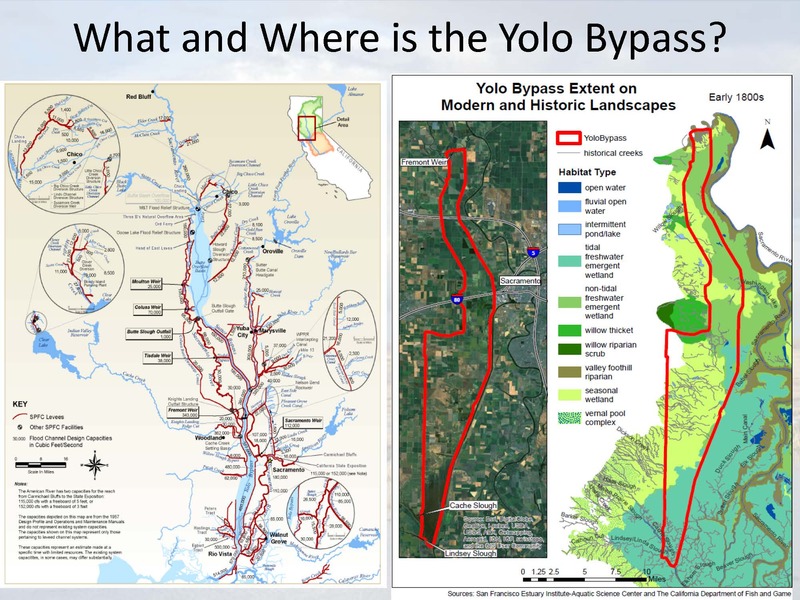 Peter Moyle began by saying that the discussion today would focus on the Yolo Bypass, which could be a great example of reconciliation ecology. 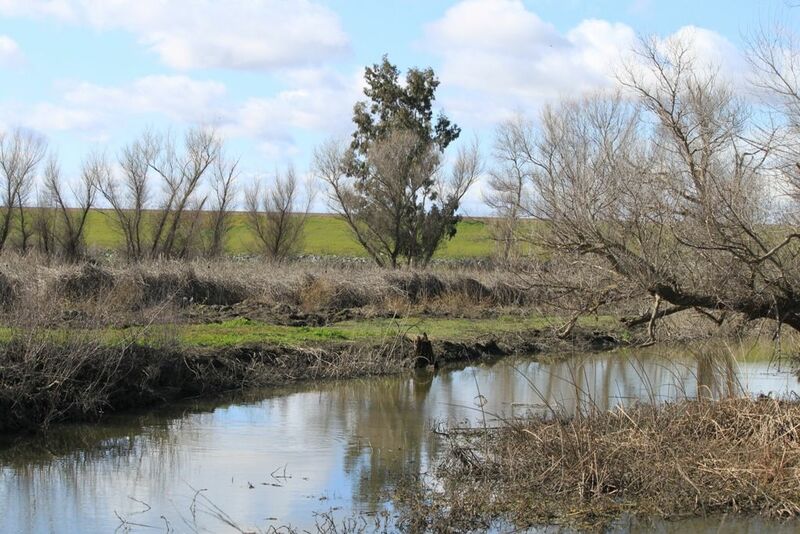 “It’s a big issue here in Yolo County, and it’s one that is potentially important for the future in showing the ways flood plains can be used,” he said. Mr. Moyle then introduced the speakers: Robyn Suddeth, a graduate student in hydrologic sciences at UC Davis will begin with an introduction to the Yolo Bypass. She will be followed by Robin Kulakow from the Yolo Basin Foundation; Petrea Marchand, the Executive Director of the Yolo Natural Heritage Program; Richard Howitt, a professor emeritus of agriculture on the resource economics; Bill Fleenor, senior researcher and engineer with the Center for Watershed Sciences, and Carson Jeffries, senior researcher and fish biologist with UC Davis. She presented a slide with two graphics on it, noting that the blue line on the top chart is the energy demand from the birds while the red line represents the supply. “What this graphic is showing is only the supplies that are available if you don’t count agricultural uses, so one of the things that this graphic shows is that rice and other agricultural crops are actually important players as food sources for these birds,” she said. 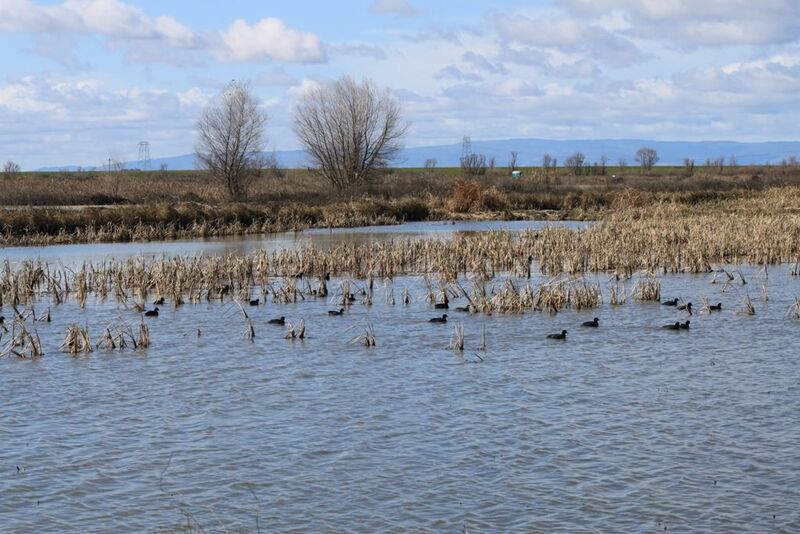 “There’s also another nuance in terms of wetland management which is that sure the birds might use it in April and May and shorebirds especially like some habitat later in the year,” she said. “But wetland managers are also farmers in the sense that they want to grow the right type of plant for food supply for the birds the following fall and if there’s water for too long on those landscapes or on those wetland units, then they also face the prospects of those food supplies not being what they otherwise could be. So it’s a very sort of balanced system.” There are also conflicts in that fish want deeper water and waterfowl tend to do better in shallower water, especially for foraging habitat, she added. There are many questions to be answered, she said. The question that was sent out to the participants asked, can the Yolo Bypass be managed as a reconciled ecosystem and if so,what are the factors that make it possible, difficult, impossible to achieve this as a general goal? And can the perceived tensions among farmers,fisheries managers, flood managers, wildlife managers,and other interests be resolved? What can be done right away? Can land use be even better integrated?, she added. A longer term question is that if more water becomes available in winter and spring through the notched weir, how can managers best take advantage of it to maximize benefits to birds and fish while also minimizing cost to farmers and private wetland owners? And are there ways to engineer improvements that further better the system? How much improvement is truly possible and is it worth the cost? 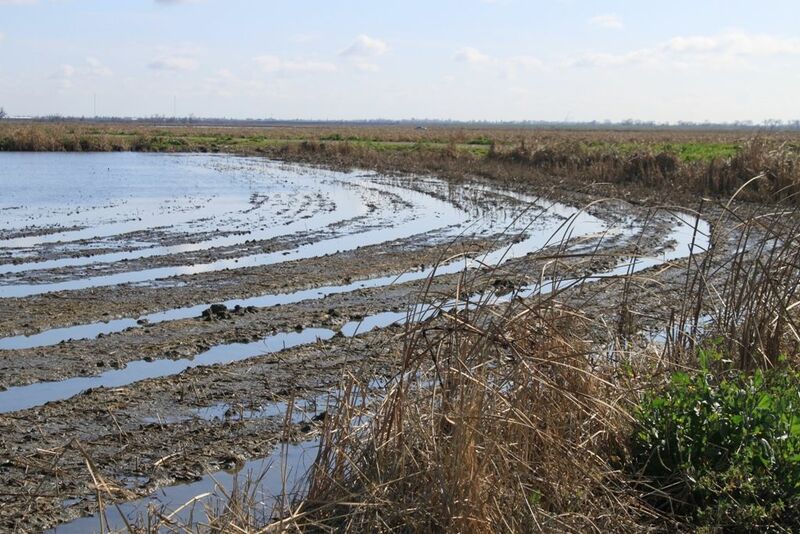 Political questions include should government try and incentivize current land managers to change practices towards a more reconciled bypass and what is the best way to mitigate for any losses to farmers,wetland managers, or duck hunters?, she said. “It’s an optimization problem of a very large magnitude and, there is no question we can solve it, but the question is, what’s the best solution for the minimum amount of money and the best outcome which is what society is looking for – society being you and I who are paying taxes?,” concluded Mr. Fleenor. He said it’s very counter-intuitive for ecologists, particularly restoration ecologists, because a rice field is quite unlike a natural flood plain, but as it turns out, flooded under normal conditions as farmers like to do to help decompose their rice, ends up being the situation where the best growing habitat is also the best farming habitat, he explained. Peter Moyle asked the panelists that if the notch was put in Fremont Weir, what would be the operating rules or restrictions you would want to see put in place? Watch this presentation on YouTube by clicking here. Click here to visit the Yolo Basin Foundation online. 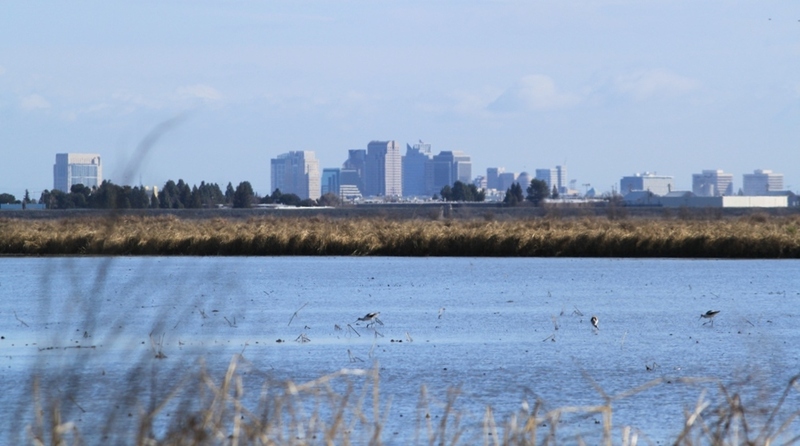 For more from Carl Jeffries on the floodplain research going on in the Yolo Bypass, click here. Click here for more presentations from the California Water Policy Seminar Series.